The Rose Bowl Flea Market makes me gitty. Wendy and I were like two magpies, combing the aisles for sparkly treasure. She has a great, vintage-20s, flapper-deco aesthetic. It was fun to see what trinkets called her name—definitely a great way to get to know each other on a new level. One vendor offered metal letters of every size and color, including polkadots. I sorted through his alphabets for a good 20 minutes—they were comically hot in the bright sun. Unfortunately, he didn’t have a website or even a business card. If someone’s looking for at Etsy opportunity, track this guy down. He’s a Rose Bowl Flea Market regular. And we all need his letters. With our car trouble, we had to leave the trailer behind, so my blinders were on when it came to furniture. That was a bit painful. However, a hunt for small treasures brought an interesting challenge. In the end, my eclectic loot included: plastic chicks, pink buttons, a rhinestone buckle, embroidered ribbons and silks, a green vase, a red scarf, and a sequined gold and black vintage circle skirt. If you're a treasure hunter too, The Rose Bowl Flea Market marks the spot. In charming ol' Pasadena, CA. This weekend I had the pleasure of speaking at the Revive blog conference in Phoenix, Arizona. It was put on by two cool ladies, Coley and Lindsey, who run an outdoor antique market twice a year called Junk in the Trunk Vintage Market. The next one is April 27th at Westworld—and I will SO be there. They wanted to reembrace their blog and improve their approach, so instead of waiting to attend a remote conference or researching the subject online, they decided to assemble an event to educate others while getting an education themselves. I was asked to give a keynote address, but because I am in the throes of designing another fabric collection—yes!—that is due this week—we decided on a Q &A instead. That way, the audience could glean what they most wanted from my being there. The other speakers joined in as well— it was great. It's always nice to step out of the studio for a break when I'm in the thick of a big project. Time away helps me gain perspective on where I'm at. And more than that, this time, I got to meet and help some wonderful and creative women in my own area. So, as I was posting images from the conference on Instagram during the event, a couple of women commented on Instagram that they felt like the only bloggers in their states. (It was Maine and South Carolina, I think.) They wished there were meet-ups in their areas as well. If you feel this way too, can I just take a moment to empower you to make it happen!? You can rent a small space or see if the city has a meeting room you can use, ask a couple of bigger bloggers to do a shout-out for you, see who might be willing to come speak. Bring in some food. Or keep things super simple with a round-table discussion amongst the attendees. The fact is, if you're feeling alone in your area, the chances are that others around are feeling the same way. You can be the solution. And you don't have to make things all fancy and froo-froo. Just get started and see what becomes. You will likely return home with a few new friends, some great ideas, and a good helping of fresh energy. Photos above are from my Instagram feed: www.Instagram.com/heatherbailey or @heatherbailey if you're in the app. Sign up for Instagram, it's awesome. Look what came in the mail for Charlotte and Elijah. Aunt Laura is too clever. I'm a bit surprised the U.S. Post Office will accept eggs as envelopes. But here's proof. I can't believe Easter is next week already. We have no plans. Every branch of my family has some big to-do or major stress they are dealing with right now. No one is really free to host. It might fall to me, as my design load does not warrant the same reverence as some of the others' stressors. We could probably handle a backyard BBQ. How to make it Eastery though? Hm. Anyhoo. There's still time to mail out easter eggs filled with candy, making nieces and nephews very happy. Send earrings for a sister or ribbons for a friend's ponytail. They may cost a little more to ship than envelopes, but the added delight is worth the added pennies. Such a fun surprise! How about I announce some winners? Has it been long enough? Har, har. Jen from Backwoods Wife, give me a holler, along with Naomi from Nome’s Brag-a-Long. Come on down! You can each have your pick of travel mugs and Pocket Posh books. Thanks for making my birthday bright. And to the following new mamas, all with babies that were due about the same time as my little guy. I am your Mid-Night Commiserator; we are sisters is sleep deprivation. Thanks, everyone, for the birthday wishes, stories, laughs, etc. (Have a look—great stories!) As I have said before, I wish we all lived in one, weird, modern town where we could get together for sewing bees on Sundays and dance parties every Friday night. Thank you for your friendship. Winners, I will email each of you with instructions. If you don’t hear from me in the next two days or so, assume my email got lost in the VooDoo Net and send me an email (link in sidebar). * The collage shown above was made by the lovely Lynette Carroll using HB papers & such. What I want to know is whether the 15" green leather bag from The Cambridge Satchel Company will fit my 17" laptop. This is a pressing matter, as my birthday is only six months away. If that won't fit, then perhaps these will. Of course, leather boots may not work for Arizona in August. Half Birthday then? That's next week. Want to help me out here? Nothing like a giant-mouse maxi skirt to freshen up an otherwise dull wardrobe. This vintage get-up says something, but what exactly? "Beware the Rodent of Unusual Size." Nail it & I'll send you a gift of some sort. I'm in the thick of fabric design and can use a good laugh -- clearly. I missed the end of the auction while I was out of town or I might have caved. I imagine wearing this number to the studio with a white shirt, drippy earrings, and an I'm-dead-serious business-bun. There would be a candy bar in store for whomever on my team snickered first. I'm in Minneapolis, MN for The Creative Connection this week. What an amazing crowd of bloggers and business women! All brought together by Nancy Soriano, Jo Packham, and their fantastic friends and staff. It is an honor to be invited as a speaker and panelist. They have put together a perfect schedule of business-fodder, food, and fun, along with an impressive Handmade Market. The event kicks off tomorrow morning with a variety of classes for the attendees. At lunchtime, The Pioneer Woman, Ree Drummond, will join in for some Q & A. Then MaryJane Butters and Amy Butler will speak at the kick-off dinner. I have an autograph party tomorrow night and two panels on Friday, centered on business development, with some meals and meetings in there as well. Saturday morning I'm listening in on another panel, then heading back home. It's a full schedule. Isaac and Elijah have been at Boy Scouts Camp this week. Isaac is there to teach Wilderness Survival. Elijah is there to survive. And have fun. There isn't much budget for outfitting the boys with survival gear, so Isaac has been mighty resourceful. One of the projects the boys are working on is this emergency kit. It is made from two square pieces of metal flashing. Duct tape covers the sharp edges and creates the spine of the booklet design. The highly-reflective mirror-like tape on the outside is for emergency signaling. On the inside of the kit are fishing hooks, weights, fishing line, wire, safety pins, crazy-strong thread, and needles. The kit closes into a compact and is kept shut by a strip of hair-band elastic that has been riveted to one side of the flashing. And it's orange, so they won't lose it. It was my opinion that they should close the kits with complete, un-cut hair-band elastics. That way, if a boy is stuck surviving for weeks in the woods, he will have something to tie his wild-child hair back with. But, ah well. It's a several-part class he's teaching, so there are other projects too, as well as gobs of survival information -- Isaac is really into this subject -- and an overnight survival camp-out where the boys have to build their own shelter and whatnot. Today I find out whether Elijah survived or not. My campers return this afternoon. I'm feeling appropriately patriotic. If you have a chance to watch The Story of Us series on the History Channel, do. I've watched several episodes over the last two days. It's had me choked up on more than one occasion -- the struggles and triumphs of our country's past (and present). The series is intelligently paced. It ties in the technological advancements of each era as well, and shows their impact on historical events. It's just good. So now LA Ink is on while I type. I go high-brow, I go low-brow. I'm strangely relating to this episode. The main tattoo chick is interviewing for two new employees while absorbing their duties in the meantime. I'm hiring for two positions right now too. Sorting through resumes took an entire day by itself. Tattoo chick, I feel you. I'm not too busy to celebrate Memorial Day though! The BBQ brigade is coming to our house today. We have a new backyard to christen, after all. And it's gorgeous out. For now. Hug a soldier, hug a veteran, hug the free earth beneath your feet! Wow, is it already the end of May? I have a book-contribution to photograph, fabric to finesse, patterns to polish, kids to cuddle. (Now I'm just having fun with alliteration.) Mayday, Mayday! Minneapolis, what a beautiful city! I don't know what I was expecting exactly, but I was pleasantly surprised. The weather was great, the city was clean and lively, and the public transit system was fantastic, and there was a Target right downtown. I picked up some flip-flops and chocolate on Thursday, grabbed apples and couscous on Friday, and made a last-minute umbrella-run for Saturday's rain. This is exciting stuff -- as on most of my city-stays, I lack some mundane object I have left behind; there was no want this time. I love to catch up with everyone at Market. Friends everywhere with new patterns, new books, new fabric, new fabric shops, new wallpaper. Some with launch-parties, some with cake-parties. I forget to work. Minneapolis was great. I feel completely refreshed right now. And I'm happy to be home to my little green garden of growing things. I have a number of outdoor projects to scoot-to before the coming heat scoots me back inside: work tables to build, chairs to refinish, a storage unit to clear out, a new garden to tend. Truthfully, I can't even start on this list till a whole different work-list is checked. We'll see how it goes. The blaze is on its way. I've got some fresh energy so I'm hopeful. I'll keep a camera handy. And school is out tomorrow! My kids are all mine again. This makes me squishy. I go. I have some fun, old sewing books I like to flip through on occasion -- sometimes for laughs. Take for instance the following discussion about the absurdity of various fashion trends, from Fabrics and Dress by Rathbone and Tarple, 1937. Hang in there with me. There's a good laugh coming. First up is the fabulous headdress above, a la Marie Antoinette -- Watch out madame, you're tipping starboard! "Shoes with long toes were another absurdity of fashion to which we often point with ridicule... richer and more eminent personages wore shoes with tips a foot long and princes two feet (Fig. 4)" And so forth. "Another recent fashion, which will probably seem as absurd as many of these when it becomes long out-of-date, is the very short skirt of 1928-1929, which was about three inches above the knee (Fig. 7) When worn with extremely high heels, it made the expanse of the legs much longer than the length of the skirt..."
What woman would want her legs to look longer by wearing a short not-that-short skirt? Just the most absurd idea in fashion ever -- the extremely short skirt of 1928-1929 -- clearly as absurd as the pirate hat and the carrot shoe. It will never last. Regarding poulaines: "Such shoes proved a hazard among the French Crusaders at the Battle of Nicopolis (1396) when they had to cut off the tips in order to run away." Isaac Asimov, Isaac Asimov's Book of Facts, 1979. Some fashions don't repeat themselves -- for good reason. I'm so ready for Christmas songs, twinkle lights, gingerbread cookies -- the whole shbang. I have looked forward to the holidays all year. Our last Christmas was pretty hectic and tiring with Isaac in the hospital and whatnot. This year we are all drinking an appropriate amount of water, to say the least. I've been working my tail off to wrap up my first stationery release (Inviting Company, Jan 2009), to get new patterns to the printer, and to prepare for my new fabric collection, Nicey Jane™. I'm so thankful these projects hit in November and not in precious, chilly December. Despite the hubbub, I channeled some of my holiday excitement into designing a fun stack of holiday gift tags as a present for our customers this year. A set of these tags will be sent out with every order placed in the month of December. And they are DANG cute. My favorite is perhaps the holly berry design at the bottom-left of the photo above, or the reindeer. There are other great holiday discounts and freebies right now at HeatherBaileyStore.com as well. Click here to take a look. Part of my holiday plan is to blog more. My goodness, where have I been? That's right, under a heavy stack of deadlines. With new patterns on the horizon and plenty of holiday projects in the works, I have lots to share, including several sewing projects that have had to stay under wraps the last two months. Ah, what a relief. First up is Miss Nicey Jane (next post) -- can - not - wait! Arizona neighbors! You will seriously miss out if you don't make your way to downtown Mesa, AZ this weekend for Blissfest 2009, presented by my ever-fabulous friends at Domestic Bliss, Kristin & Dan Alber. Stephanie Nielson and her husband, Christian, will be there. Tara Frey will be doing a book signing with her new book, Blogging for Bliss. Jaimee Rose is coming too. There will be music, dancing, dozens of artists' booths, a stagecoach -- I mean, come on, a stagecoach! I'll be at the Blogging Lounge on Saturday afternoon and the HB crew will be there too, with our own version of a general store: Trash Ties, fabric, felt, patterns, kits, chit chat, perhaps some chocolate to snack on. So, AZ folks, put your cotton-pickin' boots on and mosey on down to Friday night's 'Grand Fandango' and Saturday's Blissfest Market. Details on the flyer above or visit the Blissfest blog. Happy Fall. I don't know about your neck of the woods, but, here, the weather is gorgeous. Finally. Halloween is coming right up. Charlotte will flit around as a 'Bat Fairy' and Elijah is ready to skip the costume this year -- he's in junior high now. I'm sure he'll help eat the candy though. In celebration, on Monday, the 26th, I'm decking the halls with HoWls of fOlly for a Halloween Block Party with eight of the web's best food & lifestyle bloggers. Nine virtual haunted houses of culinary, craftiverous surprises await. Which of your favorite bloggers lurks at each haunted dwelling? What have the hosts and ghostesses prepared? Visit my blog on Monday -- if you dare. Use these miniature Firebolts to add a bit of magical flair to your favorite Harry Potter party drink. Or use the broom handles to skewer together any tasty morsels that threaten to scurry away on the dessert table. So, guess who made these necklaces? Four-year-old Charlotte did this all by herself. I thought I was embracing disaster by allowing her free access to several bins of beads while I worked on the computer today. I was entirely wrong. Not only did Miss C patiently string together all of these designs without my oversight, but she made them all symmetrical. Even her most eclectic necklace doesn't miss a beat bead. Hours and hours of necklace-making. All I did was add the clasps. And I bent a loop at the top of her one pendant. That's it. When I was four years old, my bottom dresser drawer was stocked with white paper, a stapler and staples. I made all sorts of wild inventions with white paper that year. And here I thought I had been tricky-stuff at four, with my paper robots and elephants. Looks like Charlotte has 4-year-old me mightily whooped. The moral: Moms, Grandmas, Aunts and Alligators, let your kids have access to some of your precious supplies. They may surprise you with tidiness and ingenuity! I can only imagine what I would have done with real art supplies at that age. Of course, they may surprise you with a royal disaster instead. I've been there too -- many times. Have I mentioned it's great to be back home? With an expanding roster of help around the studio, we're starting to get caught up, even ahead, on some projects. Rachel and Lindsay spent a day or two just putting together a plump stock of Strawberry Pincushion Kits, after finishing up the Flutterby Flip-Book Kits. Emily has kept everything else plugging along. Being ahead is great. I highly recommend it. 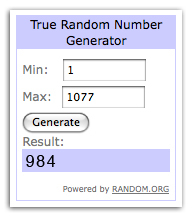 So, back to The Giveaway. What a variety of first sewing projects! I've been reading comments all day. 1. Congratulations Lindsay Brown! Random picked you for the big giveaway. 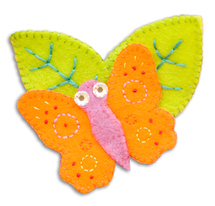 Lindsay won a Freshcut scrap bag, a HB sewing pattern of her choice, and a Flutterby Flip-Book Kit. Here's what Lindsay wrote. "Hi Heather!!! Let me start out by saying I am an ENORMOUS fan!! I just completed 2 projects for my girls. I made a pillowcase dress with the Lime Paisley and I made my youngest daughter the matching capris. I LOVE LOVE LOVE all of your fabrics!! Thanks for posting this!!" "Holy cow! 975 comments already! ... My first sewing project was a tiered skirt for my then 3-year-old daughter. I was so proud of myself! I wanted to sew for years and years and finally broke down and tried. I've been addicted ever since. I can't wait to see your new fabrics!!!" I'll be sending Shannon a Freshcut scrap bag, along with a pack of HB ribbons. 3. Then, for AndieBee, who apparently barely survived her first sewing experience, I'm sending a Strawberry Pincushion Kit, along with a copy of my Fresh Picked Pincushions sewing pattern. AndieBee wins just for surviving -- and for calling me "cupcake." Here's what AndieBee wrote. "All I remember of the rest of that day was having to drink something icky and Momma monitoring my potties! Apparently it all came out okay, since I don't remember having to go to the hospital. ;O) I picked sewing back up again when I was about 8 or 9, when Momma got tired of making Barbie clothes, and I've been sewing since." Ladies, send me your addresses. Thanks everyone for participating -- and for the blogiversary hoopla. I'm loving being back home and back to blogging, tweeting, etc. Thanks for sticking around while I was away through May. And, speaking of plumpness, check out this blog, with it's cheeky background image. Bacon-infused waffles? I'll be taking my camera with me next we go out to the fair. How long has it been? Thank heaven for Twitter. I've been on the road for the last 9 days, in Pittsburgh, Ohio & New York, hopping from one meeting to the next. My dad met up with me in the middle there and we toured around his childhood neighborhoods and mine. I lived near Pittsburgh till I was 4 or 5 and in Ohio till I was 8. It was every bit as beautiful as I remember, or more so. In most places, our next-door neighbors still lived there (wild). I have a lot to share. I can't wait to get back home and sort through the photos and stories. Yesterday, between meetings in NY, I stopped by Tinsel Trading Co. on 37th -- vintage hat flower heaven! I have some fun projects in store for this jackpot. Another reason to get home soon. So, after a quick stop by Purl Patchwork, and some other SoHo favorites this afternoon, I'll make my way to LaGuardia, then home. It's been a great trip, but I'm ready to be back with my family and back to my list of to-dos. We have some big things in store this summer. Score. One groovy, vintage needlepoint on it's way. If this is indeed as fun as it seems, then it will be cleaned, matted and framed for my grass-green loft. If not, well then, I still had fun buying it. Thanks, eBay. Charlotte's eye has started to become a little googly -- slightly 'lazy.' Hopefully a temporary eye patch over her stronger eye will force her uncovered eye to get with the program. 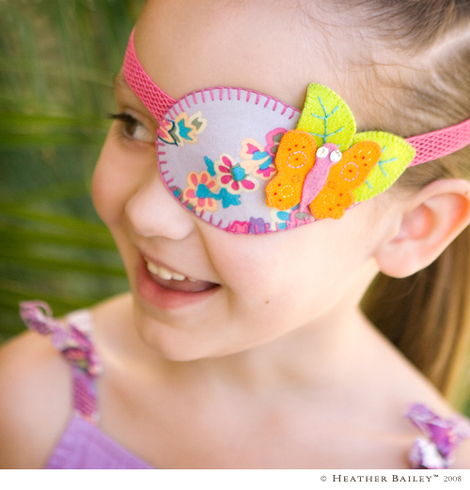 So, here's one project that's never crossed my mind before -- a custom, girly eye patch. Why not? The rigid interfacing inside the patch is darted to bulge in the middle. Then the fabric covering is cut on the bias so I could stretch it over the form smoothly without darting it. Then there's a black fabric lining the inside. Not that you'll ever want to make an eye patch. Who knows if she'll even keep it on. But it has given us all the giggles a few times over -- and kept things light. Anyone have some good advice for this sort of thing? Just what is it about this bouquet-of-one that makes me smile? 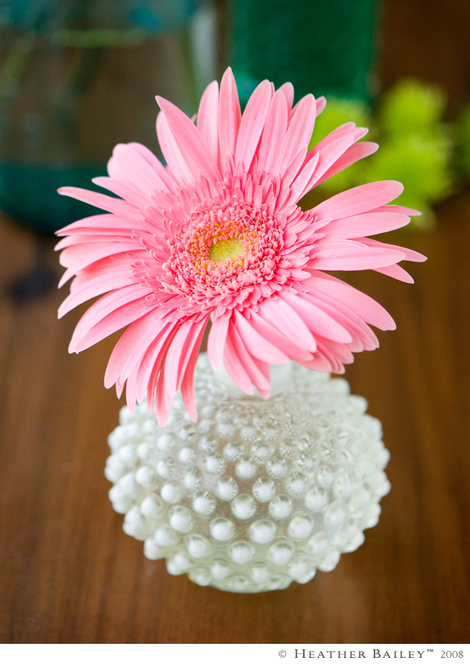 Gerbera Daisies have got to be the most innocent, la-di-da, casual, take-it-easy flowers there are. And I've always had a thing for hobnail too -- it's so silly and odd, ridiculous and fabulous at once. Look how the vase and flower make a figure 8 together. Bam. I love that! One of my Pop Garden prints is named 'Pop Daisy' - one big, bursting daisy. This bouquet reminds me of that print -- happy & simple, just like my Sunday ought to be. That's the goal anyhow. Busy week coming up. Pretty little flowers all around the house to keep things energetic -- one of my favorite tricks. I love old trucks. 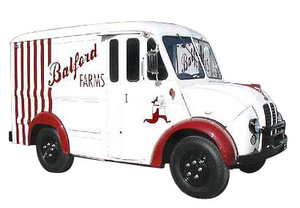 One day I'd love to have a real, souped-up old delivery truck with a new engine in it so I could drive it whenever, wherever. 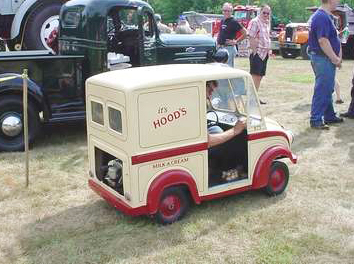 Somehow I ended up on a milk-truck hunt the other day on the internet. Not shopping, just learning new things and taking a break. 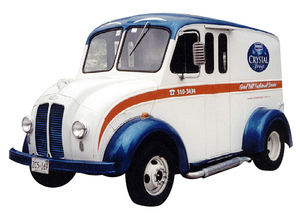 It looks like a company called Divco made all of the cool old milk trucks and most other multi-stop vehicles for a good, long time. 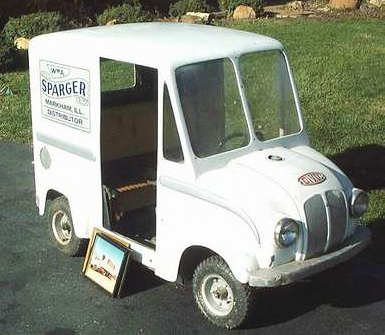 They produced teensy tiny delivery trucks for their dealers too. I'm curious if they had working engines. Here's one -- and another -- adorable. Too bad neither Pimp My Ride nor Overhaulin' was around yet when I lived in Hollywood. Then my delivery-truck fantasy could have included some ridiculous theme that suited my personality or hobbies of choice. They do some crazy stuff on those shows. True, I'm not sure what I'd want to put in the back of my dream delivery truck -- or what might be my obvious theme. In the absence of the perfect idea, I'm sure a couple of added seats might satisfy well enough -- that is, if my kids would allow me to drive them around in such a silly vehicle. Ooo, what if it was a mobile studio with seatbelts? With craft storage built in? And what should it look like? I don't know. Maybe I'd just want the back to be empty. I'm clearly just daydreaming here. I'm still working out the details.